Twitter is a great place to communicate with people. Here is a list of ways I am using twitter and you can too to generate more business. 1. Complete your profile to the full. 2. Use personal picture instead of company logo (people like to socialise with people). 3. Put some thought to the twitter background. It is your space to market and use it to your advantage. 4. Find influencer’s (known people in your industry) and follow them. 5. Retweet what know people are tweeting about. 6. Tweet about your interests as well. 7. Twitter search is a great tool to find those prospects tweeting about your product or services. Find them and start replying by helping them (no selling). 8. Don’t afraid to tweet about good stuff of your competitors (be helpful as much as possible). 9. Tweet about your staff, customers or interesting events (make them feel special). 11. Write blog posts about your products, services and share on twitter. 12. Social media is no different than actual socialising always consider this before tweeting. 13. Use direct message to sell (do not spam). 14. Use URL shortness to add links such as www.bit.ly. 15. When promoting your blog posts ask for retweet. You normally don’t get what you want without asking. 16. Focus on your niche and plan your tweets around that. Focus is a power. 17. When you are starting try to do at least 3 to 5 tweets at a different time of the day. 18. Tweeter is great place to talk, use @reply to talk to people. 19. Plan the timings of your tweet normally people use twitter a lot when commuting, lunch break or after office hours. Plan your tweets around these times. 20. Use your keywords in the tweet. 21. You can use free tools like tweetdeck to schedule your tweets, but people generally don’t like automated tweets. So be human because you are socialising try to mix schedule and real time tweeting. 22. Tweet about your special offers or discounts. 23. Tweet to educate your prospects about your products and services. 24. Do not over promote your self on any social media. 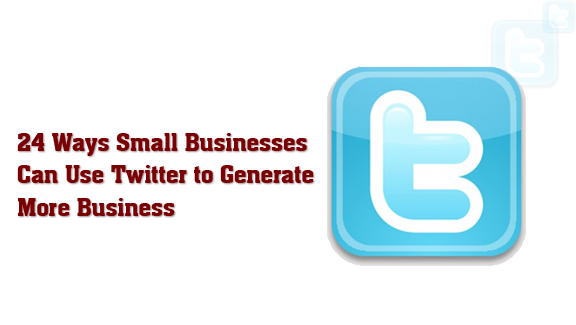 How you are using twitter to leverage your small business? Add in the comments below and let list grow.